I am so excited to show you these beauties! Essie New Zealand was kind enough to send me a selection of their nail lacquers to swatch and create nail art with. I'm still going to make another tutorial using this brand, but in the meantime check out this Daisy nail art and Water Marble nail art on my YouTube channel ☺. In this post I'll provide a close-up shot and short review of each polish. Don't they look beautiful all together? Some of the shades turned out a bit bright in the pictures, but they're still a pretty good representation of them. The colours always change depending on the light you're in anyway ☺. Also, some of the colours were from specific collections -I've been told they're 2014 ones, and I've listed them as such but I've seen other swatching posts referring to them as 2013 collections. I think it depends on the country, as the collections themselves (as in, the shades in them) vary a bit. Essie has only recently been re-released in New Zealand so perhaps the set-up is a bit different here. I'll update this if I learn something new! One last thing; New Zealanders, you can buy Essie nail lacquer from Farmers. (I just had a giggle at how strange that must sound to people from other countries!). Firstly we have Ballet Slippers, which with one coat would be a good base for french polish. I think it's a lovely colour, and you could make it more opaque with more coats - this is with two. The name is perfect! Go Ginza is a what I tend to call a "gentle" colour. Baby purple, a lilac, the kind of polish that won't get people gasping at your bravado but will work well with most outfits. Too subtle for my taste but considering I'm a nail art fanatic that's not surprising! This is three coats, and is slightly darker in real life. Warm and Toasty Turtleneck is part of the Winter 2014 Limited Edition Collection. It's a beautiful off-lavender creme polish. Opacity is reached in two coats, which is perfect. Need A Vacation is a very girly polish, a medium pink, pastel creme. It's slightly darker than in the photos and is just lovely. I used three coats. Madison Ave-Hue is a beautiful shimmery pink polish. It's a fair bit brighter in real life - this picture doesn't do it justice! This is two coats. Jamaica Me Crazy is awesome! So bright and vibrant. It screams princesses and fairies and unicorns - little girl overload. It's got a shimmer to it and while it's mostly pink, it's got a touch of purple in some lights. This is two coats. Essie - Jamaica Me Crazy. Tart Deco a bright, pastel-orange creme polish. One of my favourites from this lot! I used 2-3 coats for this (it varied from finger to finger). Sunday Funday is a beautiful coral shimmer, more red than orange. This is with 2-3 coats and I really liked it ☺. Fifth Avenue is your standard bright red - creme, two-coater and applies well, like the rest of them. Not something I'd go with on a regular basis as I feel red polish has been way over-worn, but it's perfect for nail art. Of course, that's just my opinion, I'm sure heaps of people love red nails! There are no rules when it comes to nails, just personal preferences. In Stitches is a burnt umber colour, a beautiful reddish-brown. It's a creme and reaches opacity in two coats. Shearling Darling is the colour of red wine, and I think it'll be a favourite simply because of that! I love the finish as well, very sleek. It's a mid-dark red and this is two coats. It's from the Winter 2014 Limited Edition Collection. Wicked is a chocolatey creme polish - yum! It's a dark reddish-brown with the same sleek finish as Shearling Darling. Sable Collar is from the Essie Winter 2014 Limited Edition Collection and is a reddish-brown with a strong micro shimmer. It seemed almost holographic when I applied it! If you want to see a photo of it in the sun, check out The Polishaholic's pictures here. This is two coats. After School Boy Blazer is my new go-to navy! It's deep, rich tones look gorgeous and I love the finish. It's part of the Fall 2014 Limited Edition Collection and I've used two coats. Essie - After School Boy Blazer. For the Twill of it is my favourite out of all of these! It's also from the Fall 2014 Limited Edition Collection and is a beautiful holographic polish. I captured this shot in quite a bright light but there are heaps of other swatches of it in darker lights - which completely changes the look! It's one that keeps you admiring your nails all day - green, blue and purple shimmery perfection! This is two coats. Essie - For the Twill of it. Another favourite of mine - I'm a big fan of greens and blues and this turquoise stole my heart! The shimmery flecks throughout it really make it special as well. It's a little bit greener in real life, but still lovely. This is with two coats. This is a bit bluer in real life; it's a lovely wintery colour - no surprises that it's in the Essie Winter 2014 Limited Edition Collection! It's a blue-grey with a slight shimmer and this is two coats. I also found it amusing when reviewing my notes for this colour - I called it an "older person's colour!" Each to their own, of course, but my colour choices seem to keep me in permanent teenage-land. Bikini so Teeny is a beautiful pastel polish with a subtle shimmer. This is two-three coats. Another favourite of mine! Hope you like these swatches - I love these polishes and they are now all displayed on my nail desk amongst my favourites! I found them all easy to apply, a nice thin consistency while most of them still reach opacity at just two coats. 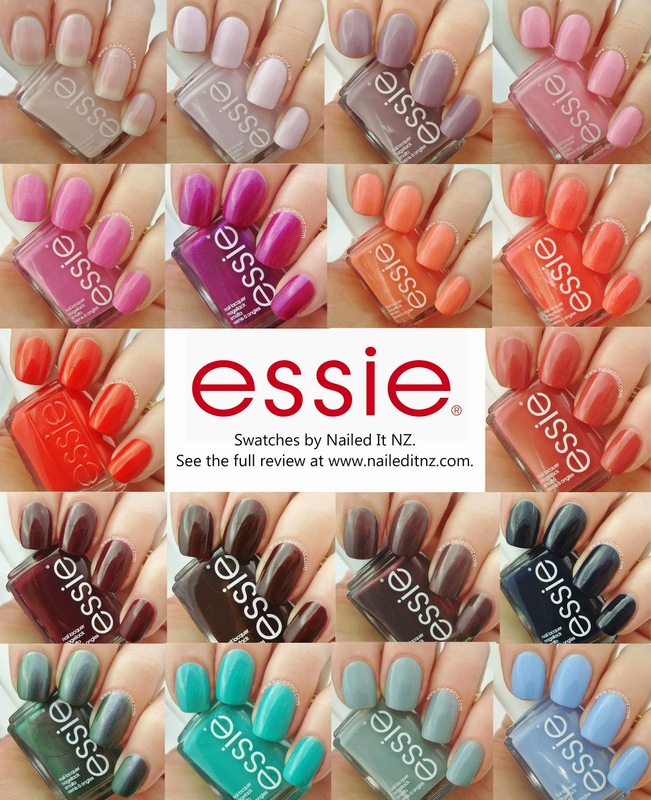 The nail polishes in this post were provided to me for honest review by Essie New Zealand. I want most of them! Some great shades from Essie! Jessie, some of these are also my own personal favorites here in the US! Your swatches are very pretty and I agree with you: the colors can appear very different under changing light conditions.